One of the first challengers to the Porsche 962 platform exploded onto the scene after a lengthy hiatus from top level sports car competition. They traded in their wire wheels and burlwood dashboards for magnesium and carbon Kevlar. A big cat was on the prowl for victories. Jaguar had not seen a win at Le Mans since 1957 with the D-Type. With the FIA introduction of Group C rules to the World Sportscar Championship, the prospect of going racing once again looked more attractive. However, Jaguar did not jump right into the European circuit, especially in the midst of a Porsche stranglehold on the title each year. They instead turned to Bob Tullius, owner and driver of American racing team Group 44 Racing with the intention to build a car that would compete in IMSA’s emerging GTP class. Tullius had been a long time enthusiast for the British manufacturer when he founded Group 44 Racing in the early 1960’s with partner Brian Feurstenau. He spent the majority of the next two decades campaigning E-Type Jaguars in the United States. Additionally, his keen interest in the innovative Howmet gas turbine engine Le Mans racer project in 1968 and commandeering of the car through the race that year determined him to return to the event one day in a car of his own design. Tullius approached Mike Dale of Jaguar Cars Inc. in New Jersey to fund him for a new project: the XJR-5. Tullius recruited Lee Dykstra, a former designer for Ford and GM to help him in coming up with a new, up –to-date chassis made to run the Jaguar V12 already in use in a championship winning E-Type variant. By January of 1982, concept drawings and clay models of the new car were released to the public. The design included an aluminum sheet monocoque chassis with a honeycomb structure floor section and tubular reinforced steel bulkheads. Garnishing the chassis was a carbon fiber and Kevlar composite molded aerodynamics package that had been tested and tuned in Lockheeds’ wind tunnel, and employed the full use of ground effects. The XJR-5’s underbelly featured long aerodynamic venture ducts that extended from the fully stressed V12 engine block mounted behind the driver cockpit, and curving inward towards the rear exit beneath the massive full width spoiler. The engine itself was an aluminum block 5.3L carbureted V12 initially outputting 650hp and 480 ft/lb of torque. The engine also relied on nothing but atmospheric pressure for air intake as Jaguar had elected not to originally develop the motor for turbocharging. After some initial test runs which began as early as June of the 1982, the prototype chassis was seeing its first racing action in late August. Tullius and co-driver Bill Adam took the XJR-5 to a third place finish behind two Porsche 935s at Road America. A promising debut no doubt, which catapulted Lee Dykstra on a lengthy development program to improve the cars competitiveness. One of the more prominent advancements was under the hood, where the 5.3L V12 grew to 6.0L with brand new engine management systems. Exactly one year following the XJR-5 debut, Tullius scored a victory at Road Atlanta, with further wins at Lime Rock, Mosport and Pocono; a dream season for such a young car that fell short only in the final championship standings to Porsche driver Al Holbert. While success in IMSA is all well and good, the Europeans are hard to impress. 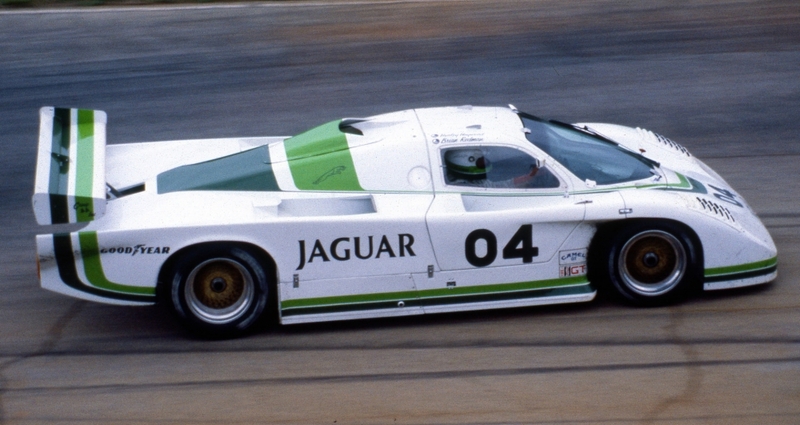 In May of 1983, Group 44 sent an XJR-5 to Jaguar headquarters for them to put the car through their own testing regime. Derek Bell drove the car to high praise. Upon his favourable word on the racer, Jaguar gave the final green light for Group 44 to participate in the 1984 24 Hours of Le Mans. While the team did not complete the race, the car itself made a big impression.